All states have their unique places to ice fish, Mille Lacs in Minnesota, Waubay Lake in South Dakota, Devils Lake in North Dakota, the famed Lake Cascade in Idaho and the Mississippi River backwaters of Wisconsin. Those are some high class destinations here in the Ice Belt, but where does Iowa claim its ice fishing fame? In my opinion it resides in the Okoboji area. West Lake Okoboji, East Lake Okoboji and Spirit lake make a up a chain of lakes on the most northern part of Western Iowa. This chain of lakes has a huge variety of fish to keep you busy drilling holes all winter long. I live about 4 hours from this destination, but it is a place that I try to schedule a couple trips to each year. I had one of those trips recently on my annual Christmas break from work. 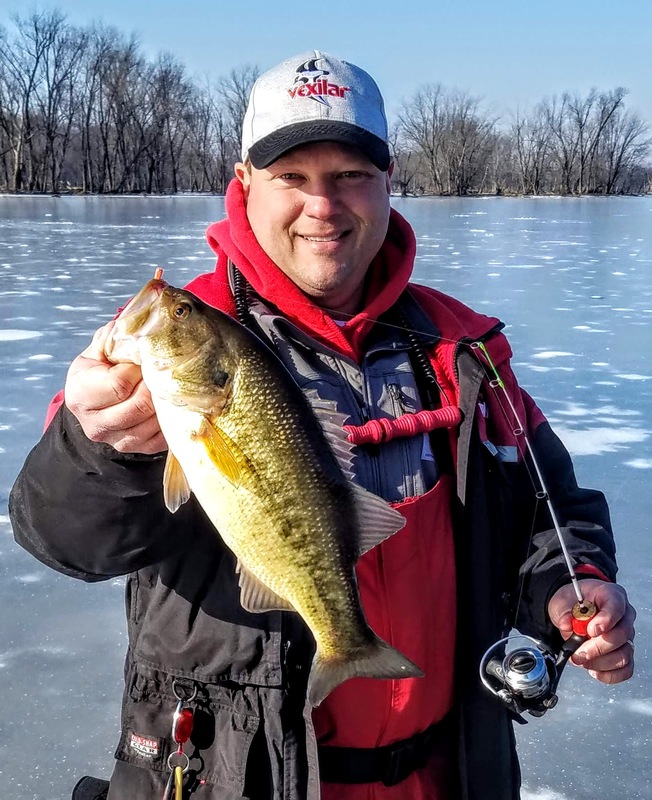 We fished Emerson Bay on West Okoboji and Spirit Lake on this trip, as much of the ice was not quite ready for ice anglers. The pure numbers of fish in these two lakes continues to amaze me with each trip up there. Bluegills and crappies were the targeted fish of the this trip and we certainly chased them down. We explored Emerson Bay the first two days we were there. This area I am familiar with and the typical bites were there. A good gill bite was had in most areas we tried, a few crappies were mixed in too. Our last stop was to head north to Spirit Lake. A little bait and help from Kabeles Bait shop, as they pointed us in the right direction, and we were off. Again the bluegills and crappies were more than willing to cooperate with us, even a few perch were mixed in. Shallow was certainly the key on Spirit Lake, as well as finding some green weeds. If you ever get the chance to go to Okoboji, the answer should be "YES, when are we leaving." 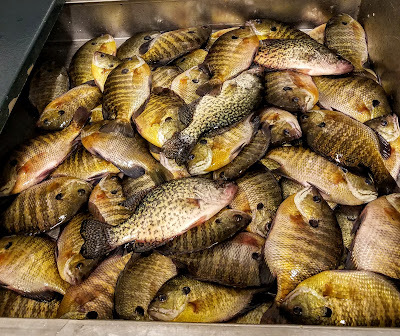 The bluegills just grow different up there, tall and thick, making for some great fillets for the dinner table. Enjoy these lakes if you can this year, I know I will get there as much as possible! The Mississippi River has been a popular place for me to fish in the past 2 decades. Countless trips in the boat to search around for largemouth and smallmouth bass, but never have I drilled a hole in the ice on this massive body of water in my life. Today a friend showed me around and gave me the chance to see what the big river can be like in the winter. He has fished the big river many of times in the winter and was kind enough to show me a few places to get me started. A chance I couldn't turn down. We hit a few areas in the middle of Pool 9 and quickly started catching some BIG river bluegills. Shallow backwater areas are key locations as I have read about and learned in the past. Three or four feet of water is plenty for these gills to hide themselves in the winter. 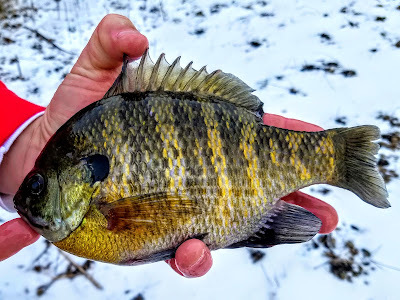 Hole hopping with the Vexilar FLX-28 made the task easy as each fish showed itself as soon as the ice-ducer was dropped in the water. A quick drop of the jig down the hole and BOOM, they were on it. 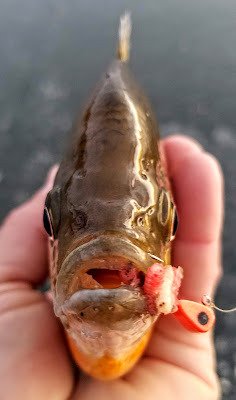 The bite died down a bit mid-morning and we were off to DeSoto Bay. This is a popular fishing area year-round. I couldn't wait to get there and see what was waiting for us. A long walk is what was waiting for us...but well worth every step. Again, I have fished this area in a boat countless times for bass but today was like a brand new adventure. I was like a kid on December 24th! Drilling is always part of ice fishing, but we really drilled this bay up. We tries areas from 4feet deep all the way out to 14 feet deep. Fish were located fairly deep and a steady bite was had all afternoon. For the day I caught 8 different species of fish; bluegill, redear sunfish, yellow bass, white bass, crappie, shad, perch and largemouth bass. You just never know what you might catch on the Mighty Mississippi River. It has always held a special place in my heart for fishing, but now has even a bigger spot as I added it to my ice fishing destinations.